Bainbridge Island Metro Parks & Recreation Celebrating 50 Years of Service! From their website: Come one, come all to our Birthday Bash! It will be held on August 29, 2015 at Battle Point Park from 11am to 8pm. There will be fun filled family activities until 4pm as well as entertainment for all on the main stage until 8pm. Free admission with a suggested donation of school supplies. Call	the main office at (206)	842-2306 for more details. This year’s rockin’ Street Dance will be bigger and better than ever! Two stages will host live music and DJ hits. The Main Stage at the head of Madrone Lane will kick off the evening at 6:00 PM with the National Anthem performed by our Ice Queen, Victoria Robertson. From there, the Queen and the Pirate King take to the streets near Ericksen with a full program of family fun. There will be a song-and-dance-along; a treasure hunt; a costume parade; balloon sculptures courtesy of The Balloon Brothers; sidewalk chalk and face painting courtesy of Calico Toy Shoppe. All this will make the evening special for the whole family. Kids of all ages are invited to wear their favorite costume. The event’s Platinum Sponsor Virginia Mason will spin the wheel for prizes at their booth! At 8:00 PM, Victoria Robertson will kick off karaoke for those who want to show their singing talents. There will be an abundance of options to refuel with several local food stands and, new this year, TWO Beer & Wine Gardens, with beer from local favorite Bainbridge Island Brewing and wine from Ambrosia Wine Group. 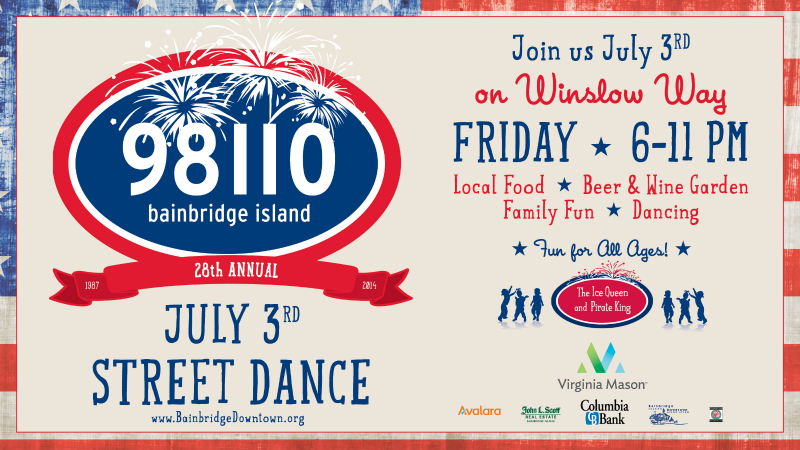 Special thanks to our July 3rd Street Dance sponsors: Platinum Sponsor Virginia Mason, Gold Sponsor Columbia Bank and Silver Sponsors John L. Scott, Avalara and Flamingo Audio. We couldn’t offer this community-wide event without your support! Please consider volunteering for this event. We only ask for ONE shift, you can join the party before or after you help out! BIDA cannot operate this beloved event without you! Please contact Sarah Barnes, Program Manager at BIDA at (206) 579-1258 or sarah@bainbridgedowntown.org. You can also sign-up on our event webpage by clicking here. For your convenience, click here for you easy to read and printable Fact Sheet on the event. IMPORTANT REMINDER: Winslow Way East from Madison Ave. to Ericksen Ave. will be closed to all vehicle traffic from 3:00 PM to 11:30 PM.